The big trends were towards electromobility and connectivity though other significant motivators of change on many stands were the impending universal adoption of the 19.5-tonnes GVW across Europe (the usefulness of which is limited by the retention of the 11.5-tonnes rear axle limit) and the impending requirement for ECE66R02 rollover certification which potentially puts even more weight into coach designs to achieve even stronger structures. With the exception of a few products for markets outside Europe, there was nothing Euro5 powered to be seen, and if you talked to people from outside the UK they couldn’t believe (and were disgusted) that it was still possible to register Euro5 in our market. 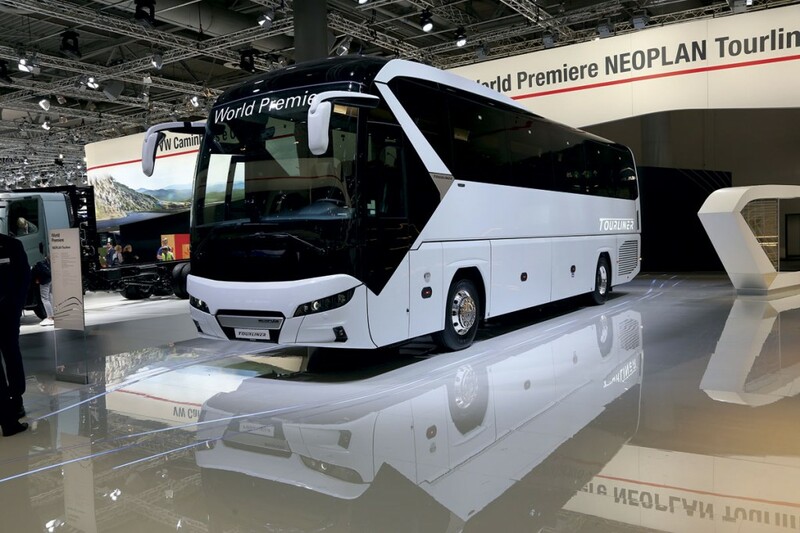 For UK customers the big news from MAN was the launch of the new Neoplan Tourliner model. A development of the familiar Tourliner, it features extensively remodelled front and rear sections that bring the styling in line with the Neoplan look found on the Cityliner and Skyliner, neither of which is available in the UK. The cleaner look creates a lower drag coefficient of 0.36 and simplifies access to bulbs and other components in the process. There are also changes to the sides, particularly around the trademark sloping feature pillar, while the interior is offered with new colour options moving it away from the cool blues that have hitherto been standard. Structurally, the coach is 18cm longer, the additional length added within the wheelbase to the rear of the front axle, giving around 0.5cum of extra luggage capacity. New locker flaps are far easier to open and close and a light in the nearside mirror arm illuminates the door area. Despite the additional structure needed to satisfy the impending ECE R66.02 rollover requirements, the overall weight has been reduced by 60kg, the rear engine flap alone accounting for 15kg as it is now GRP rather than steel. With the exception of the lamps, none of the front and rear panels are common with the Cityliner. UK engine options are the 420hp and 460hp versions of the Euro6C unit with fuel consumption said to be 10% better and reports of 20litres/100km (11.76mpg) reported in tests. Senior Retail Coach Sales Executive, Matt Jacobs, told B&CB the right hand drive version of the new MAN Tourliner is expected to be ready for UK delivery in mid-July 2017 in tri-axle form, with the two-axle following shortly afterwards. The earliest it will be seen on these shores is at the UK Coach Rally, with a Blackpool outing for the prototype envisaged. One of the aspects of the vehicle MAN is really keen to promote is the full wheelchair access it will provide, which will be available ‘across the board’ on all size variants. It will see an additional side door with a wheelchair lift installed, forming just a part of the full PSVR specification that can be offered on this vehicle. The MAN equivalent of the Tourliner is the Lion’s Coach, the 7,500th example of which, a 13.26m long 52 seater with 440hp engine, was sold during the show to Der Krostitzer, a German operator. It was also the first show for the Lion’s Intercity, shown in 13.254m long C format with 63 seats and the D0836 290hp/213kW engine. Just as interesting as the new Tourliner was an articulated Lion’s City bus, carrying ‘electromobility’ and e-modularity slogans, into which MAN had incorporated a variety of technologies including a Siemens hybrid system, fast charge equipment including an overhead pantograph, an overnight charging capability with a battery capacity steppable from 200kwh to 400kwh and a fuel cell range extender. In appearance, it adopted the enhanced styling first seen on MAN’s hybrid Lion’s City products. 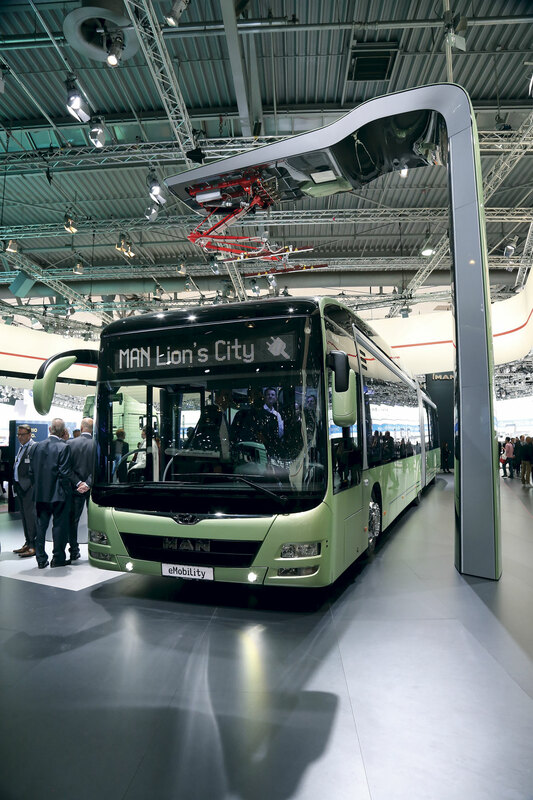 MAN has handed the Bus of the Year mantle to Solaris but a variation on the gas theme that won it the 2015 International Bus of the Year title was the display of a 12m Lion’s City with the E2876 gas engine. A departure for MAN is a move into the van sector where it will offer a fully MAN branded derivative of the latest generation Volkswagen Crafter to be known as the MAN TGE. There will be minibus variants which will offer a new string to the MAN bow. It has become customary for the group to display products from Latin America, and this time it was a 12,49m Volksbus 18-280 OT LE with Marcopolo Viale BRS 39seat/41standee body and Euro5 D0836 engine. This ran on 100% sugar cane. A very different new coach was the 12m BYD electric coach which it claims is a world first. With a six metre wheelbase, two 180 electric motors and BYD’s Iron Phosphate battery technology it was said to require a recharging time of only three hours with two 40kW chargers. Range is between 140km and 200km. Within an overall height of 3.54m, it has a floor height of 1020mm and interior headroom of 2020mm with a seated passenger capacity of 51. I didn’t see him myself but I’m told that TfL’s Leon Daniels was in Hanover looking at the coach, 15 of which have so far been ordered for operation in Paris by two operators. 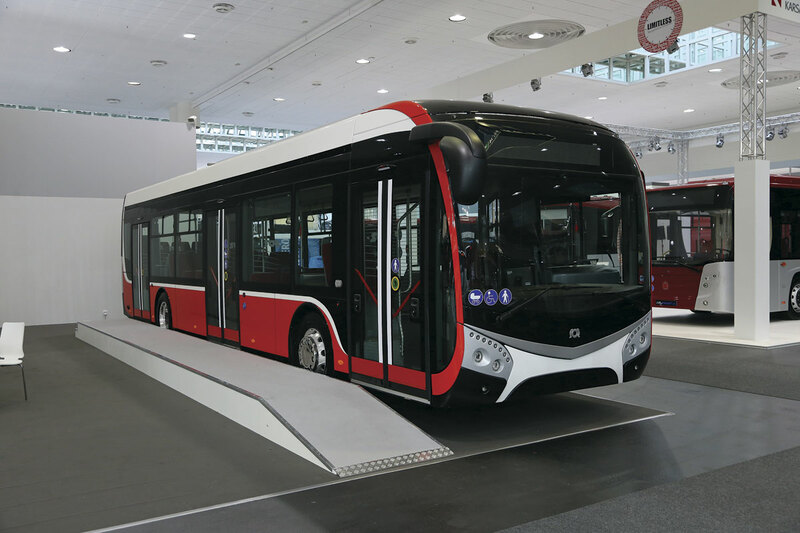 The second exhibit was BYD’s e-Bus in left hand drive. Nottingham will shortly take delivery of its vehicles which may well be the last completely Chinese built BYD service buses for the UK because future ones will be bodied by ADL. At a press conference, MD of BYD Europe, Isbrand Ho said that BYD was well advanced in developing a European assembly plant and ‘we’ll tell you where soon.’ He also revealed that it was starting on a new monorail project, having earlier said that BYD was an ‘integrated public transport supplier – think Bombardier or Hitachi’. 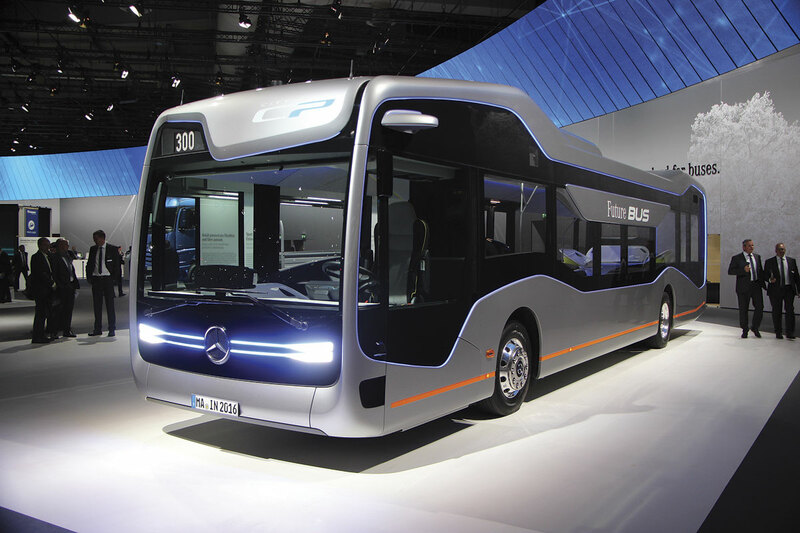 Star of the bus element of Daimler’s stand was the Bus of the Future, the autonomous bus with City Pilot control system. This futuristic looking design, based on the Citaro, was extensively covered in B&CB issue 1389, 29 July 2016. Though Daimler’s Bus of the Future was not electric as shown, we’ll have to wait for that, there was a huge emphasis on electromobility on the stand with the launch of the Urban e-truck, the Vision Van with electric drive and drones on the roof and the new (but still rather uninspiringly styled) Fuso eCanter electric delivery truck, the first production examples of which will be delivered in Japan and the USA at the end of next year. E-drive vans will be available from 2018. Hartmut Schick, head of Daimler Buses, believes that 70% of new city buses will be electric by 2030. Celebrating ten years in production was the Mercedes-Benz Tourismo coach range with a 13m, three-axle M model displayed. 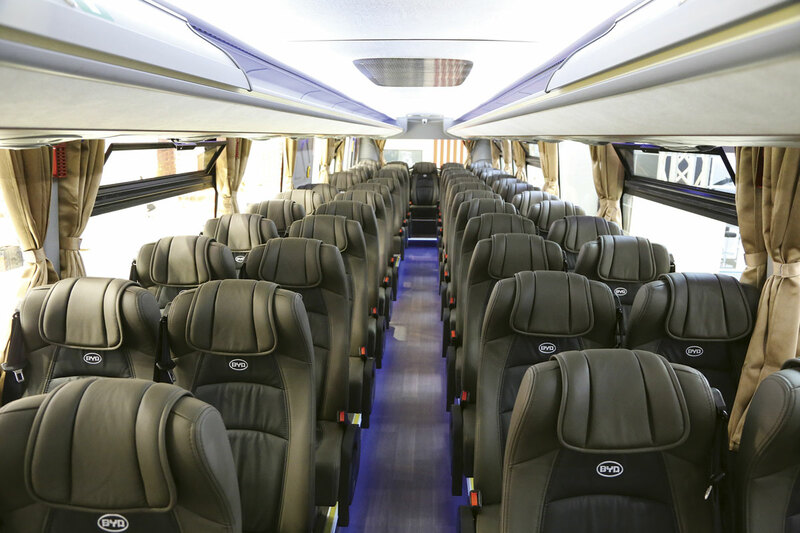 The specification incorporated the new Coach MediaRouter for internet access and 230-volt sockets within the Travel Star Eco Luxline seats. An upgrade to the Sprinter range gives them more powerful engines, especially in the lower categories, while at the upper end there is now an ex-factory Sprinter offered with a 5.5-tonne GVW. Also of great interest was the OF917 RFC school bus, the product of the Chennai based joint venture in India between Daimler and Wrightbus. Carrying the Wright W emblem on its Aluminique aluminium body, this yellow painted 9m long bus was destined for an unspecified Middle East customer. Inevitably somewhat basic by European standards, it features the 4d34i Euro3 nine-litre engine, although Euro4 is an option. 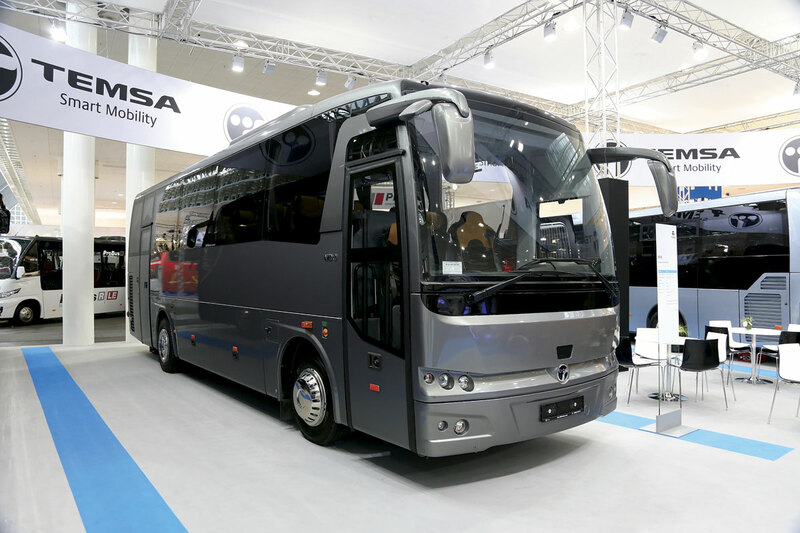 For the last ten years displayed within the Daimler hall, though still in a separate area with its own branding, was the Setra range. The exhibits here were: a three axle MultiClass S418LE Business; a ComfortClass S516MD with 48 seats, toilet and lift; a ComfortClass S515HD 44 seater; the evergreen S431DT double decker; and the top of the range 13.3m TopClass S516HDH with 1+1 rotating seating to an exotic specification including a glass roof. It was finished in an unusual matt metallic red paint. Value added products included the Bus Depot Management service, a new telediagnosis service and, for Germany only, a new service for long distance bus services with 90 service centres on key routes offering services of specific value to express operators, including cleaning, washing, toilet drops and checks. 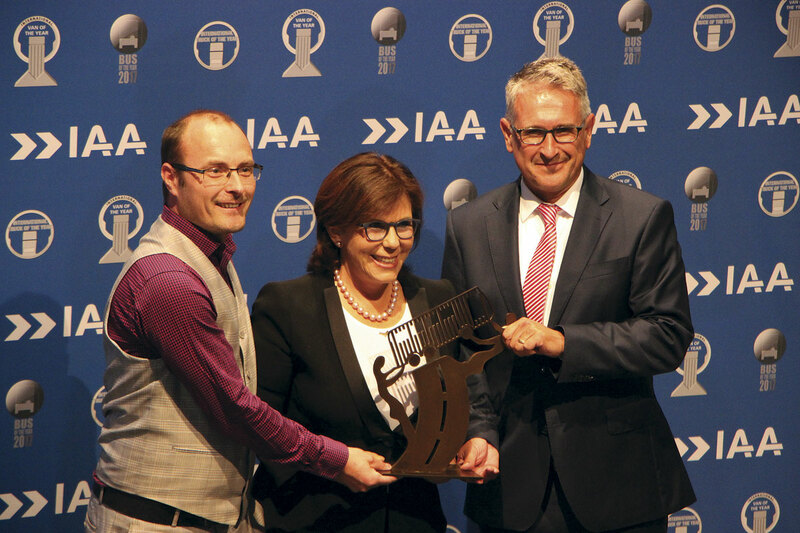 Announced as the winners of the 2017 International Bus of the Year trophy with the Urbino 12 Electric, Solaris not only showed the bus that won the trophy but also two others in a gold livery that celebrated their 20th year in business. Already over 60 have been sold for delivery this year. The other two buses shown were also 12m examples from the latest generation Urbino family, 766 of which have been sold so far. One was a CNG fuelled Urbino 12 CNG and the other the latest hybrid design featuring hybrid equipment supplied by BAE Systems. 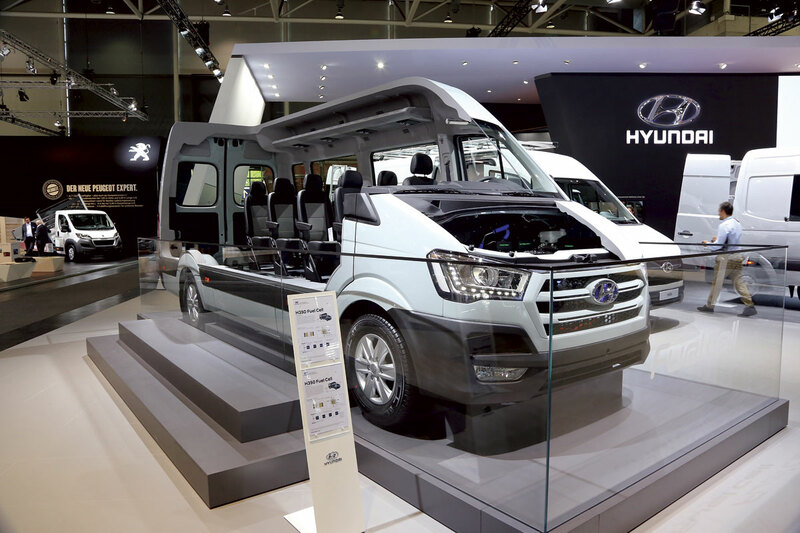 A further new model announced but not exhibited was a 10.5m long Urbino which has the same front and rear overhangs and a shorter wheelbase and can accommodate three nearside doors. Ingeniously, there are only five additional side panels that are not standard items from the existing range. Two other significant announcements were made. 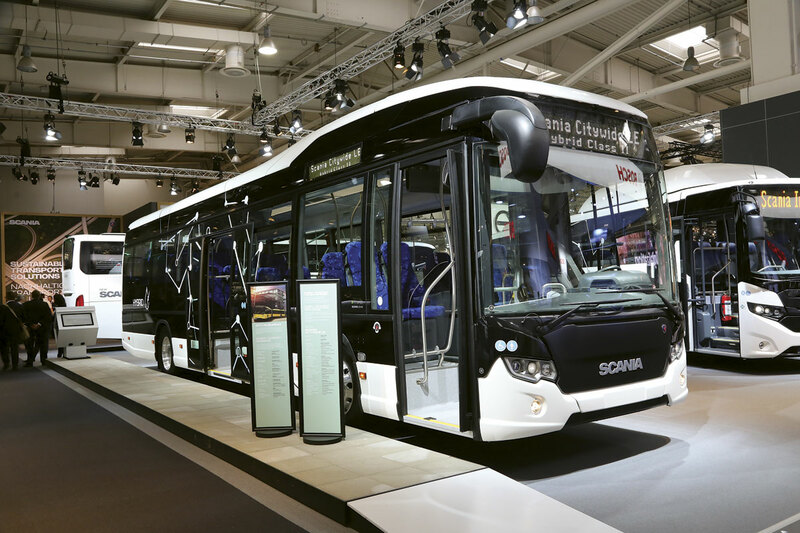 Firstly, Solaris has formed a joint venture company in India with JBM for the development, sales and service maintenance of electric and hybrid buses for the Indian market. Solaris will develop, integrate and deliver components as well as providing know how. The second important development is that Solaris and the Swiss Stadler concern are to work together on future light rail and tram tenders offering the members of their combined ranges best suited to applications. This will apply to all Polish tenders, German tenders and selected tenders in other markets. Among the exhibits shown by Iveco was the Magelys coach, the International Coach of the Year 2016, in the colours of the All Blacks rugby team. New to the fold was a new Crossway based product intended for regional express lines and shorter distance private hire/touring called the Evadys, a name Iveco has previously used for coaches. Built at the Vysoke Myto plant in the Czech Republic, it shares the external dimensions of the Crossway (2.55m wide, 3.46m high) and is offered in 12.0m and 12.96m length variants, but differs in having a floor height of 1.142m rather than 860m enabling a centrally locked underfloor luggage area of 10.2cum, 3.0cu.m more than the Crossway. The driveline features the Iveco/FPT Cursor 9 engine rated at 400hp. The Crossway range continues to be popular. 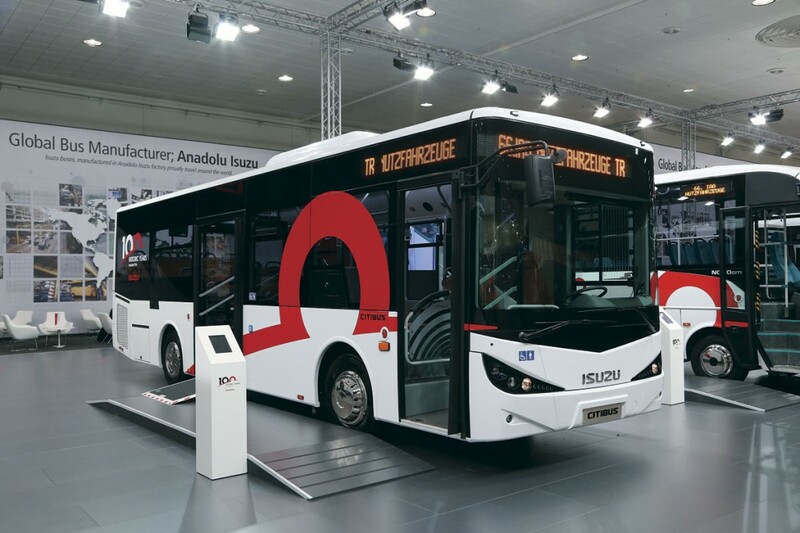 At the show it was announced that Deutsche Bahn’s DB Regio Bus operation, the biggest bus operator in Germany, has signed a two year extension to its existing framework agreement with Iveco. This will see between 150 and 200 Crossway and Crossway Low Entry buses delivered in each of the next two years, taking the total number of Crossways in its fleet to 1,000 units by 2018. Also shown was the most recent version of the Electric Daily, the company having offered electric Daily options from its main range for some time. At a Volvo press conference split between truck and bus, Claes Nilsson, President of Volvo Trucks, pointed out that the I-Shift gearbox was now in its 15th year of production and that in the Iron Knight racing truck a standard gearbox was handling torque of 2,400Nm. He said Volvo was heading towards autonomous operation, initially for underground mining applications. 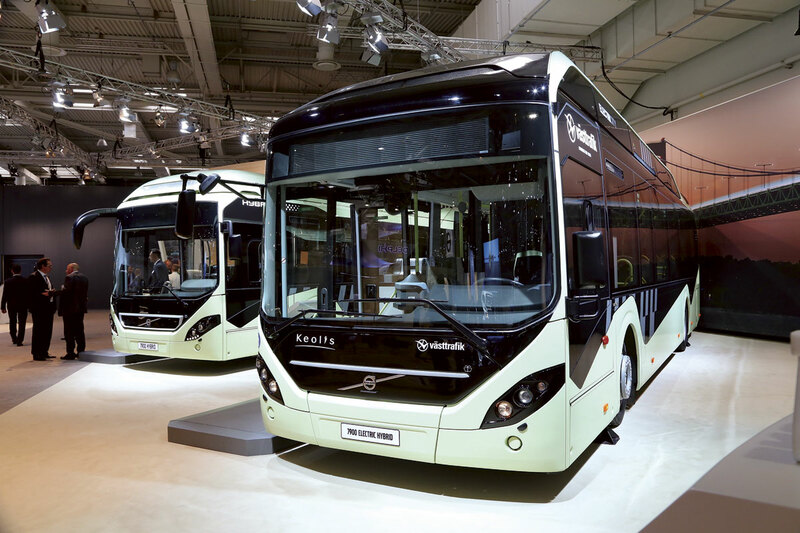 Following him, Bus Vice President, Hakan Agnevall, said that for the first time in Hanover Volvo was showing hybrid, electric hybrid and full electric buses alongside each other. Volvo believed operators needed a mix of these three tools to create the best tailored solution for all applications. 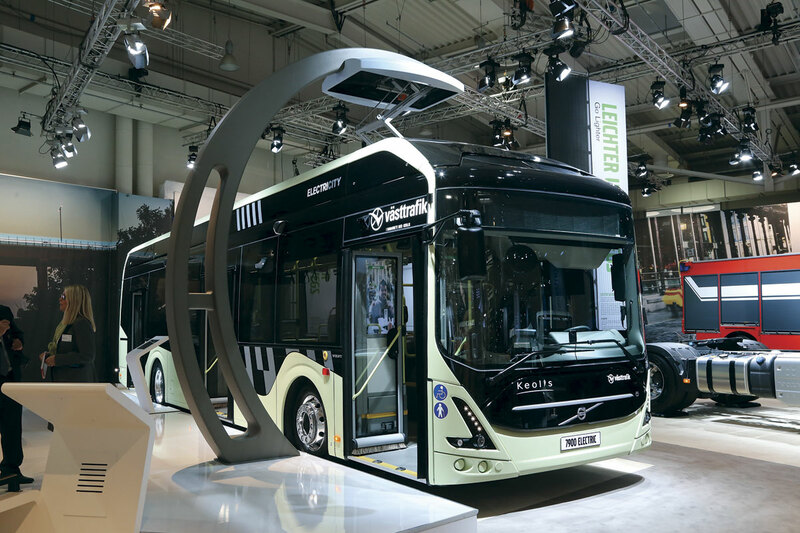 Full electrics were already running in Gothenberg and Volvo was technically ready for their broad introduction, with orders already placed by Luxembourg and Paris. He believed electromobility would change the way cities were planned. 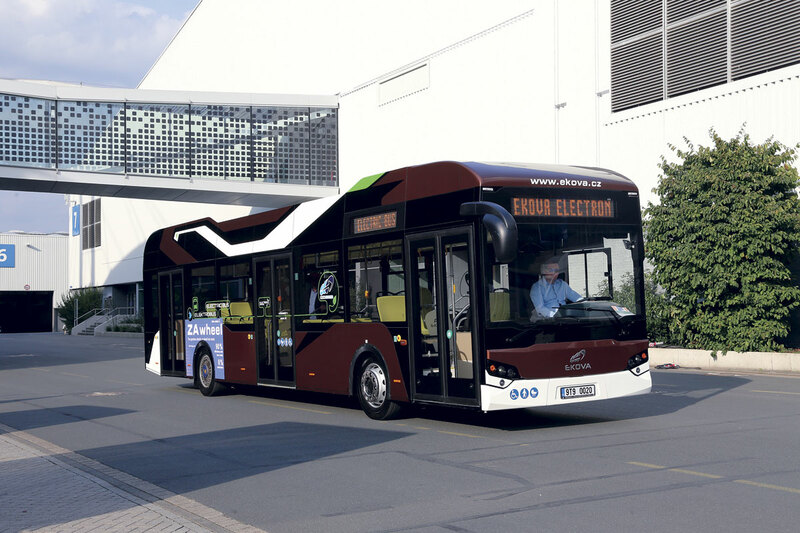 In addition to the three versions of the electromobility family on the stand, there was also a 9700 coach in a livery promoting the fact that it was fitted with dynamic steering. This electric steering system means that drivers typically endure 20-30% less muscle strain, and in some manoeuvres up to 70% less. He announced that it would be extended to the city bus and inter city bus range next year. An interesting development pointed out to me by one of my European colleagues was that Volvo is to offer a B8R chassis with bodywork built at its Indian operation to the French and Spanish markets where it will compete with products such as the Mercedes-Benz Connecto and Iveco Crossway. 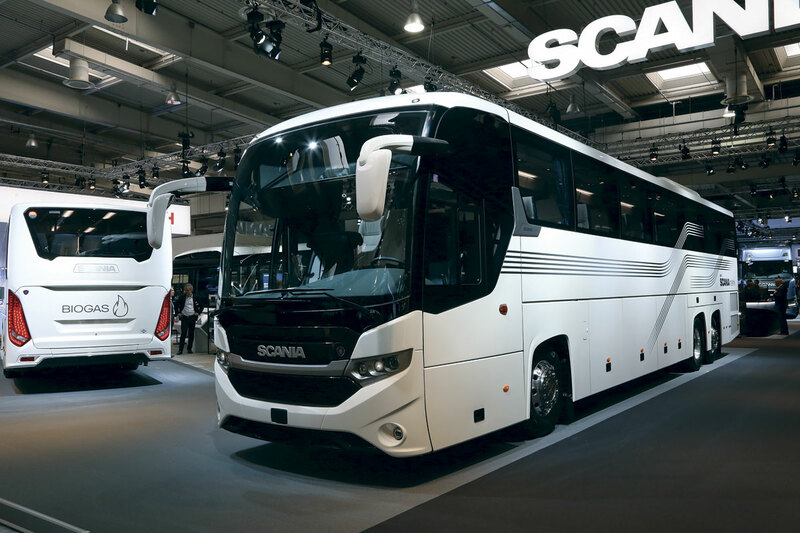 Displaying completely separately from the Volkswagen group of which it is now a part, Scania had a selection of white painted bus models given considerable prominence among its truck exhibits. Two were members of the latest Interlink family, which replaces the former OmniExpress range and the third was a Citywide LE Hybrid bus with nine-litre 320hp engine. Built at the former Lahden Autokori plant at Lahti which is now Scania owned and producing two vehicles a day, the Interlink range incorporates three height options of which two were displayed. The LD model was a 12.2m gas powered example destined for Italy with Opticruise gearbox, nine-litre engine and 1,200 litre roof mounted gas tanks. Scania claimed it was ‘the first ever completely gas driven bus with a regular floor’. 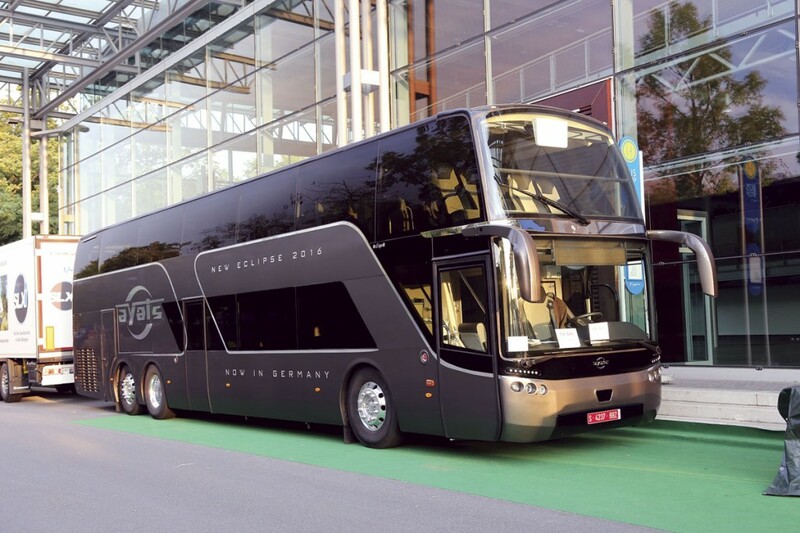 Far more coach like and, to my mind, more aesthetically attractive than the Touring, is the 3.66m high Interlink HD which appeared as a 57-seat 14m coach with a 450hp/331kW SCR-only engine and 12-speed Opticruise gearbox. 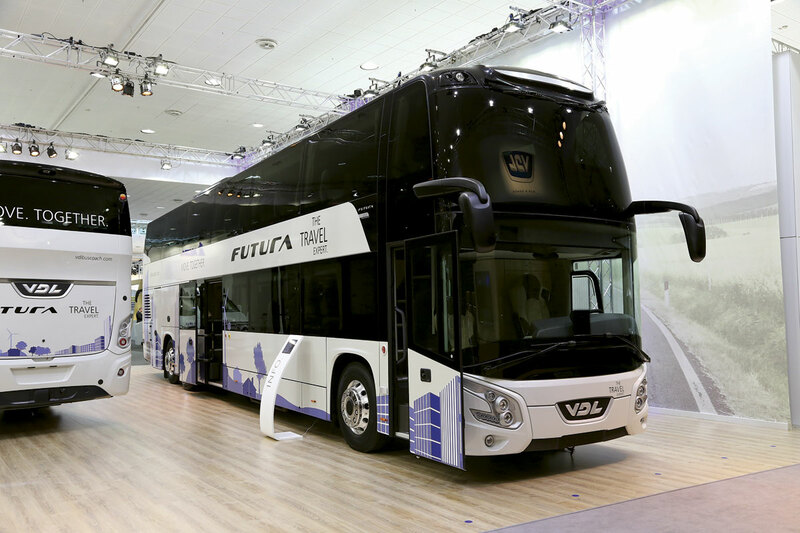 Displayed outside the halls on chassis powered by 13-litre engines were a 12.1m Scania Touring HD 49 seater and a 13.2m Van Hool Astronef 53 seater. Whilst at the show I spent some time with Scania GB’s Bus, Coach and Engine Sales Director, Tony Tomsett and Fleet Sales Manager, Mark Oliver and they were delighted to report having taken an order for ten InterLink HD coaches the previous day, though they were not able to reveal who the customer was. Consistently the most successful of the indigenous Turkish manufacturers in European sales terms, Otokar showed four vehicles, among them the Cummins ISB6.7 powered Kent C low floor city bus and the Territo U dual door school bus. 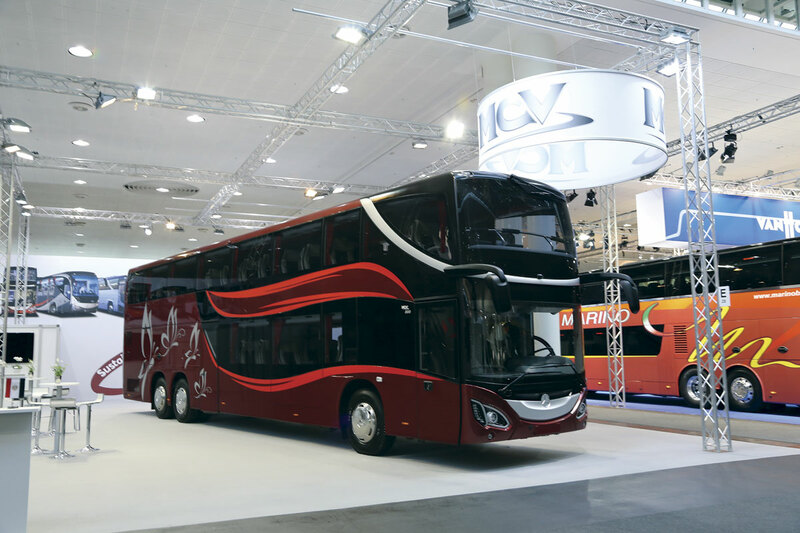 Malta added 33 12m Kent city buses to its fleet of 143 Vectio Cs earlier this year and other overseas orders include 60 Kents for Napoli, 28 Navigos for Genoa and 28 Territos for the Romanian Ministry of Defence with an option for a further 28. It is anticipated that export order will amount to 600 buses this year. Coming in the New Year, though not displayed, is a new version of the 10m Vectio touring coach with an OBDC controlled Cummins ISB engine in place of the hitherto standard MAN unit. I was told that Otokar sees potential for alternative fuels and is working on electric models. It will develop a new modular platform, initially only for electric, for which it will source the electrical elements. The shortest timescale within which an electrical model could be offered in the UK is three years. Otokar will be at the Birmingham show where three Navigo T models will be present; one on the Otokar stand, one on the Noone’s stand and one outside. To date, 12 Navigo Ts have been delivered to the UK and Ireland and feedback is reported to be good. Criticisms have been noted and are being evaluated. Among changes already made are an increase in seating capacity from 36 to 37, 20% more luggage space (up to 3.69cum) and most recently the replacement of the joystick automatic gearbox control with a conventional push button system. The UK price remains at £109,000. Four vehicles were presented on the Temsa stand though I missed their press conference which clashed with that of MAN. The four vehicles shown were, in size order, the MD9 and MD9LE, the HD and the Maraton which was unveiled last year in Kortrijk, but won’t be coming to the UK yet. The Maraton is 3.9m high and offered on two axles at 12.365m and 13.08m. The HD is 3.644m high and offered at 12.276m and 13.076m long, while the MD9 is 9.38m. The MD9LE is a dual door 9.536m bus. 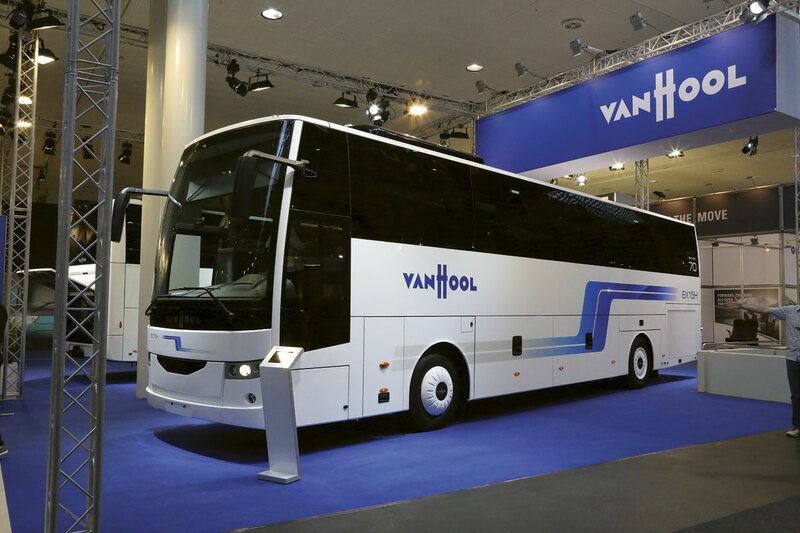 Van Hool displayed four coaches but there was little that was completely new. The one development announced was that there is now to be the option of a DAF/Paccar MX13 in the EX16H model as an alternative to the MX11 unit which remains available. Examples of both the EX16H (with 462hp MX13 unit and ZF AS-Tronic transmission) and EX15H were displayed in demonstration liveries. From the TX coach family there were a TX20 Altano and a 14.1m TDX29 Astromega double decker, the latter for Marino, a Bari based firm that has ordered 30 for its network of intercity express services. I was told that although the first examples are not scheduled for delivery until 1 Jan 2018, the first of the 30 ExquiCity articulated vehicles for Belfast are already in build. 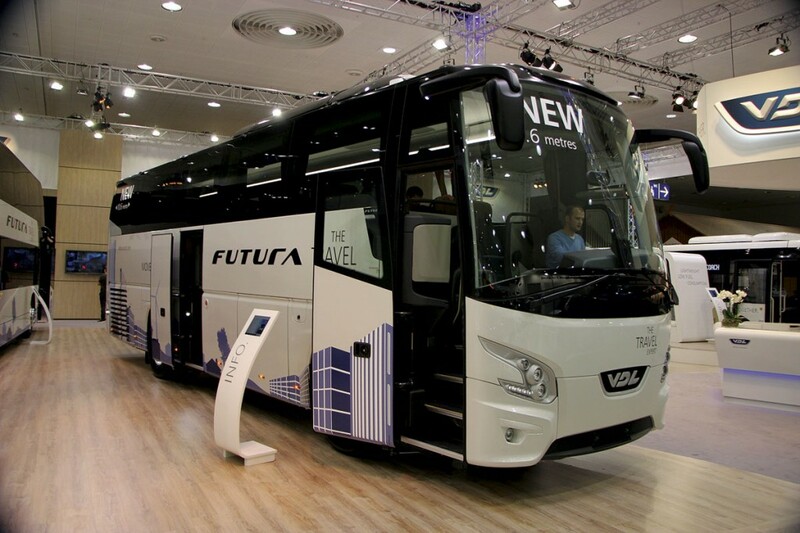 VDL introduced a variety of new models in the bus, coach and minibus sectors, although at this stage only the double deck Futura FDD2, the replacement for the former Synergy model, is definitely coming to the UK through the associated Moseley group of companies. Shown in left hand drive as a 14.145m coach seating 87 passengers, the FDD2 can also be supplied as a 13.085m model. There is provision at the centre door for wheelchair access with the show coach prepared to take two wheelchairs, one of them on a raised platform created by sliding forward two rows of seats. Hopefully joining it at some stage, if orders are forthcoming, is the new 10.605m high floor single deck version of the Futura, the FHD2-106. 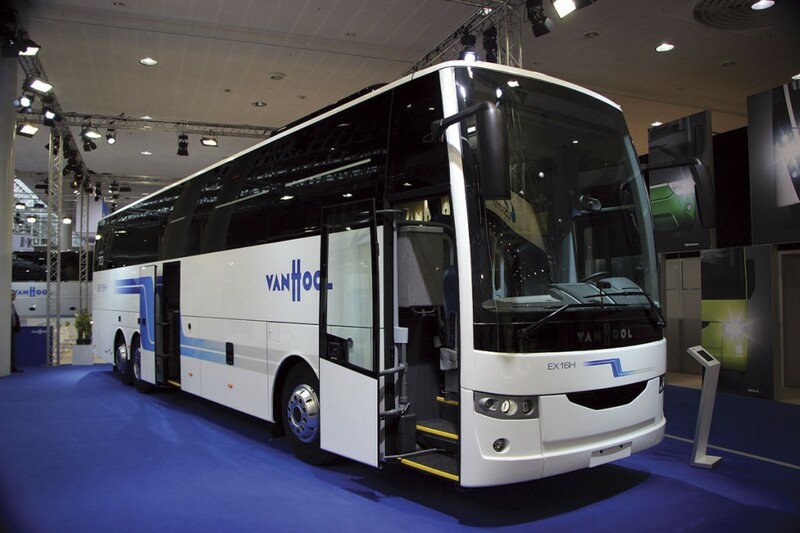 Offered with a choice of the DAF MX11-271 engine rated at 370hp/271kW or the MX11-320 at 440hp/320kW, it provides 5.1cum of luggage accommodation (with toilet) and seating for between 35 and 45 passengers. Manual, automated or automatic ZF gearboxes can be supplied with the MX11-271 but there is no auto option with the MX11-320 which puts out 2,100Nm of torque. The fuel tank is a 400-litre unit. Changes across the Futura range will see a redesigned toilet interior in light colours with the option of a 150 litre tank capacity, full LED exterior lighting, factory option USB and Wi-Fi systems, an optional 3.0cum capacity ski box for the rear and a new DDD driver drowsiness detection system. On the bus front there were three new length options for the Citea LLE (light low entry). These were 9.9m, 10.7m and 12.7m, all on two axles, and it was the shortest of the three that was displayed, with two doors and a 78 passenger capacity. The three additions as well as the existing 12.0m LLE are all Cummins ISB6.7 powered. For the mini market, a Mercedes-Benz Sprinter based offering was the Mid Basic Electric, a 3.5tonne community bus with eight passenger seats in which VDL replaces the diesel engine with an electric drivetrain, powered by a 120-150kW electric motor, which can be charged using a standard 22kW charger and European standard car charging facilities. 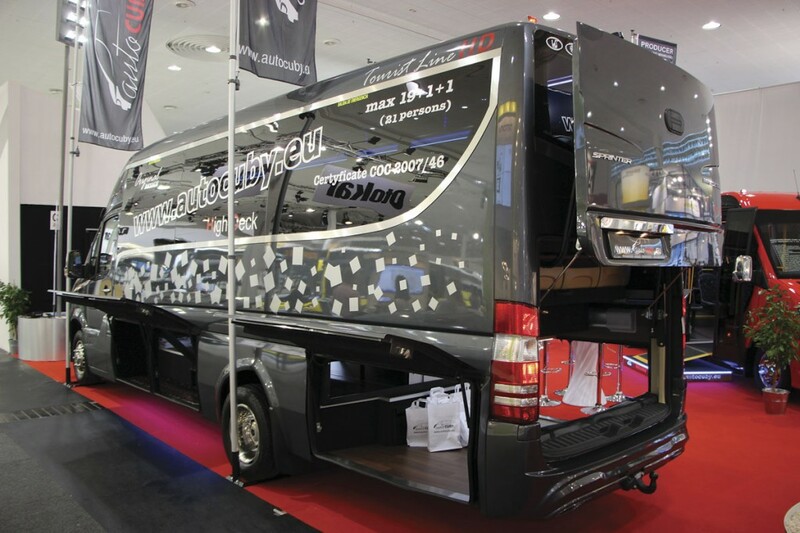 The single MCV exhibit was very different to anything the company has supplied for the UK market, although it was double deck as most UK deliveries are currently. Mounted on a Mercedes-Benz OC500RF-2542 manual gearbox chassis it was the first example of an imposing looking tri-axle coach design, the MCV800. One of four for an Egyptian customer and fitted with a Euro3 engine in this instance, it could as easily be mounted on a current Euro6 equipped chassis. It had two and one seating and a large enclosed driver’s bunk area with door to the rear of the driving compartment, resulting in no direction lower deck connection between the passengers and driver, although MCV confirmed that this was customer preference and a through aisle would be an alternative. I had hoped to catch up with Ashraf Fawzi but ran out of time to do so. Showing detail changes since 2014 and promoting their availability at Euro6, a full range of Anadolu Isuzu vehicles was shown. Smaller models feature Isuzu engines, the larger Visigo together with the Citibus and Citiport low floor buses being Cummins ISB6 powered. A company spokesman advised that they were still interested in entering the UK market as announced in 2014 although this was still sometime into the future. The vehicles indicated as having UK potential are the Visigo, a Cummins Euro6 powered 9.6m high floor high specification midicoach for up to 39 passengers and the 7.7m 28-31 seat Isuzu powered Turquoise. 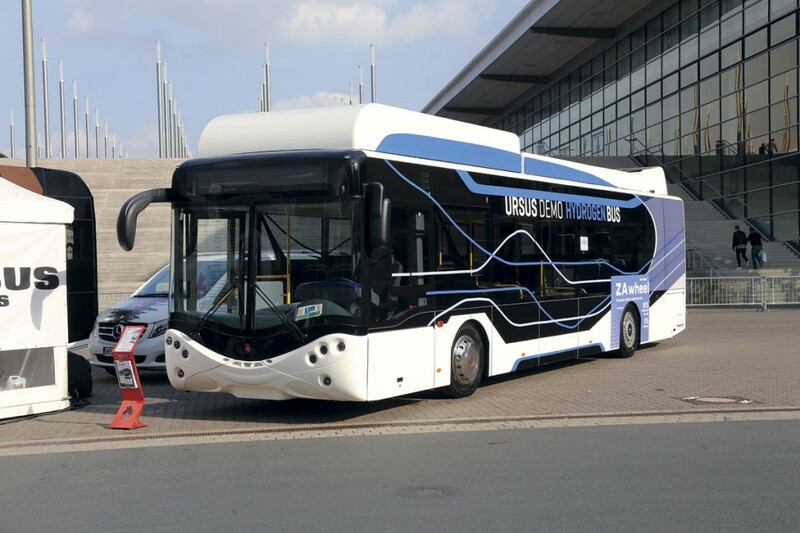 Under their ‘Limitless Transportation Solution’ vision, the key features of the Karsan display were the introduction of the electric Jest and the integration of the 10.6-18m Bredamenarinibus range under the Karsan Citymood designation. The Jest is the smallest member of the Karsan range and was developed specifically as a minibus product for city centre operation. 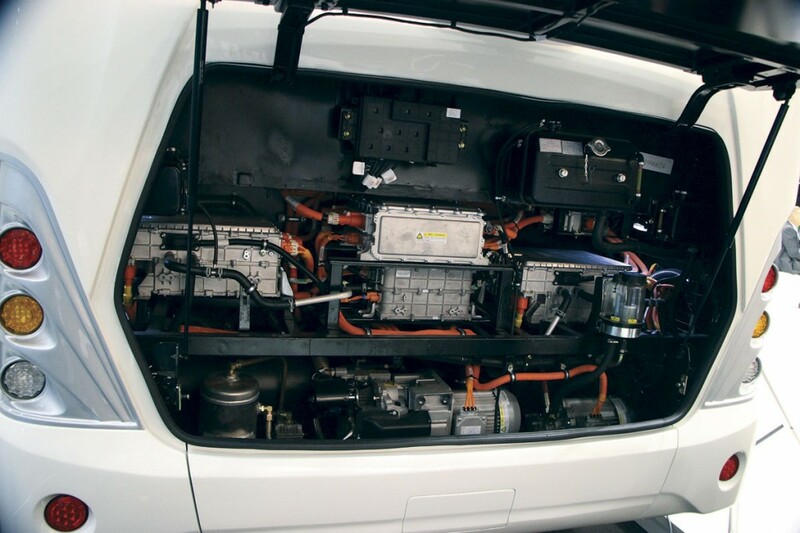 In electric form, the 5.8m vehicle has a claimed range of 165km from the 56KWh installed battery capacity. Three charging options are offered as well as the option of a petrol engine range extender. Avaialble in Europe from the end of 2016, the maximum passenger capacity is 19 with ten seated and a wheelchair space. The stand also showed examples of the Atak and Star, 8m vehicles for city and intercity applications respectively together with an SCR only Euro6 FPT powered 12m Citymood. The company’s press conference was led by Karsan Europe General Manager, David Siviero, who advised that the company was now active in nine countries and expected to extend its presence to all of Europe in the coming months. I spoke to David afterwards regarding the UK market, given his recent experience at Optare, and was advised that the UK is of interest to Karsan although initial developments will focus on the taxi rather than bus market. 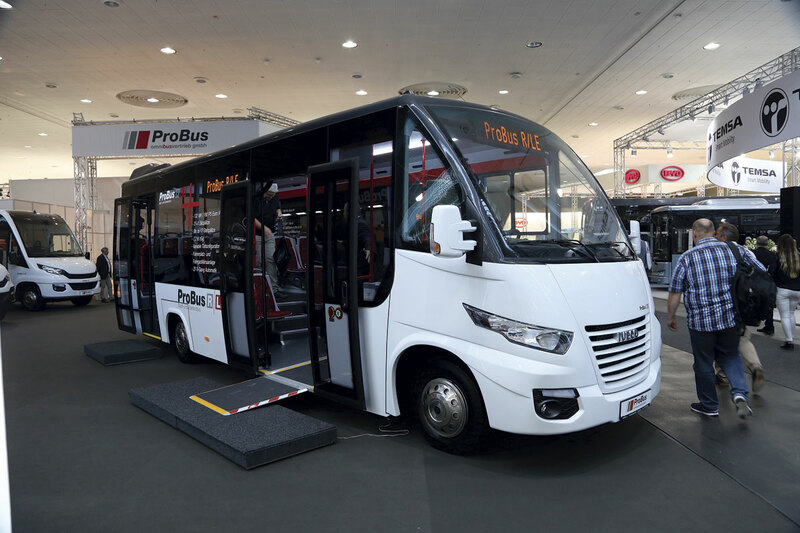 Probus offer a range of Iveco and Mercedes-Benz Sprinter based mini and midibuses on the German market. Assembled in Slovenia, the Iveco 70C17 based R/LE is a low entry 21 seat city bus, the low floor area between the axles being achieved through realignment of the drive shaft to the rear wheels. The example shown had the option of a second door and further low floor area behind the rear axle. 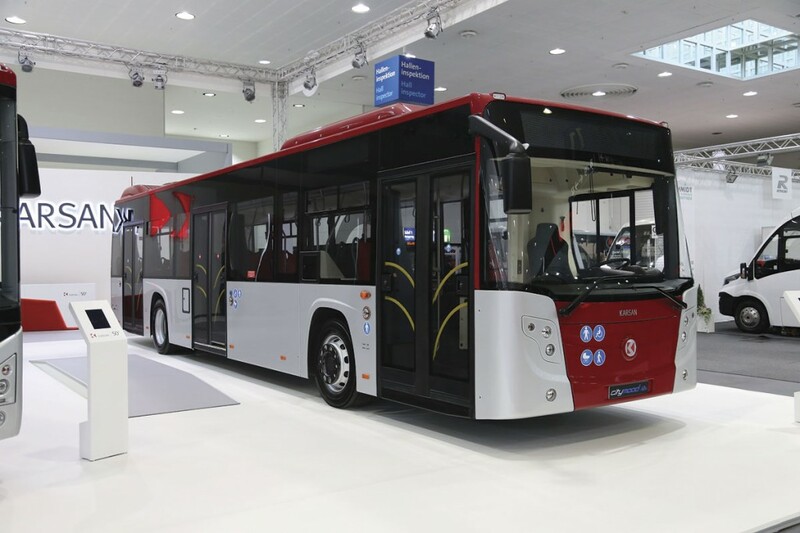 SOR was founded in the Czech Republic 25 years ago and now offers a range of vehicles from 8m to 18m using diesel, gas and electric power in both trolleybus and battery forms. 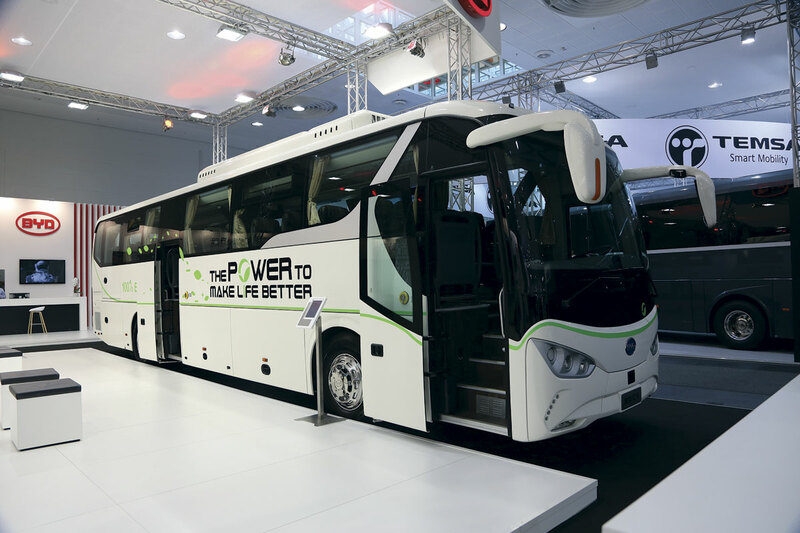 Between 700 and 800 vehicles are produced annually with the FPT Euro6 powered CN12 low entry intercity bus featuring a marked step in the roofline proving particularly popular in the German market. 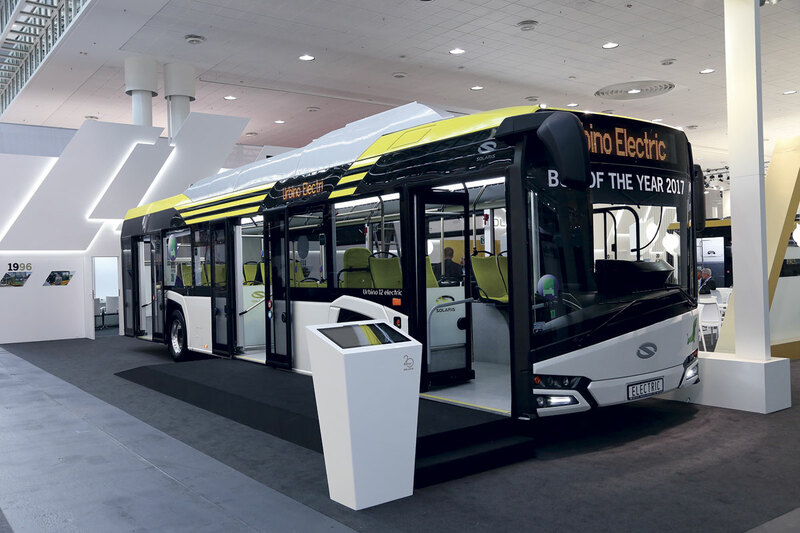 One of the latter featured on the company’s stand alongside a newly developed and attractively styled 12m electric bus which will feature in our report on electric vehicles at the IAA and Innotrans. 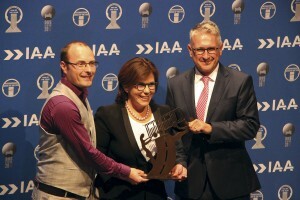 From the Ukraine, Etalon were exhibiting at IAA for the first time. 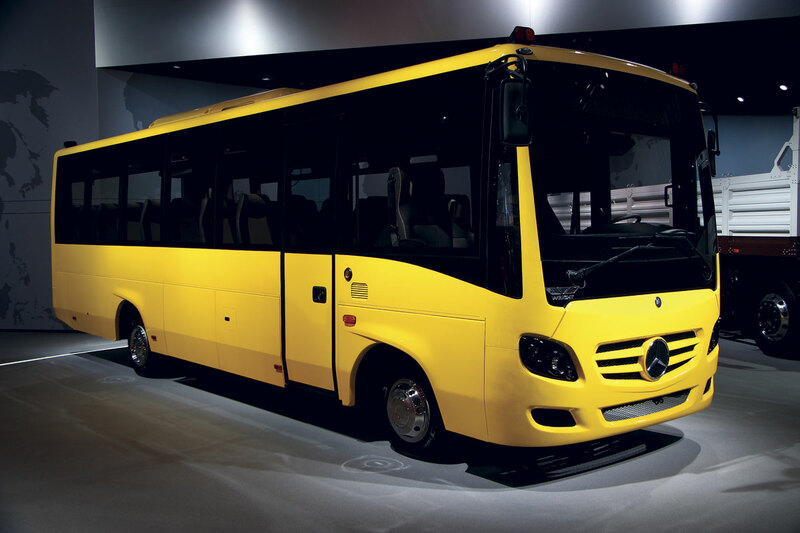 Building on their experience from bus repair and refurbishment, the company commenced building complete vehicles approximately 15 years ago and now claims to be the Ukrainian market leader having sold around 14000 vehicles in its home market to date. The vehicle displayed was a step entrance midicoach, the Tulip, based on a DAF LF chassis built at Leyland in the UK. Intended for the states in the east of the EU, it was finished to a good standard with 37 Sega seats and space for 23 standees in a 10m two door configuration with 3.2cubic metres of luggage space. As shown the centre door was two leaf but a single leaf option will also be offered with 39 seats, a wheelchair lift is another option. The engine position on the DAF chassis is a challenge to body builders and although a tidy solution had been achieved, the first row of seats on the nearside was well back from the entrance. Front and rear panels are GRP and the sides feature stretched steel panels. Mechanically, the DAF chassis has 150, 180 or 210hp Euro5 or Euro6 engine options and, as shown, a six-speed manual gearbox. Support is by a DAF service plan offered through the DAF dealer network that will also handle body part requirements. Visitors were impressed by the price which was quoted at Euros90,000 ex works in Kiev. Outside Hall 11, Ayats exhibited an example of their latest Eclipse double deck coach which follows on from the Bravo. Stylish but more restrained in adornment than its predecessor, the Eclipse is flush glazed. The example shown was on an MAN chassis although the company will also offer a Scania option in European markets. 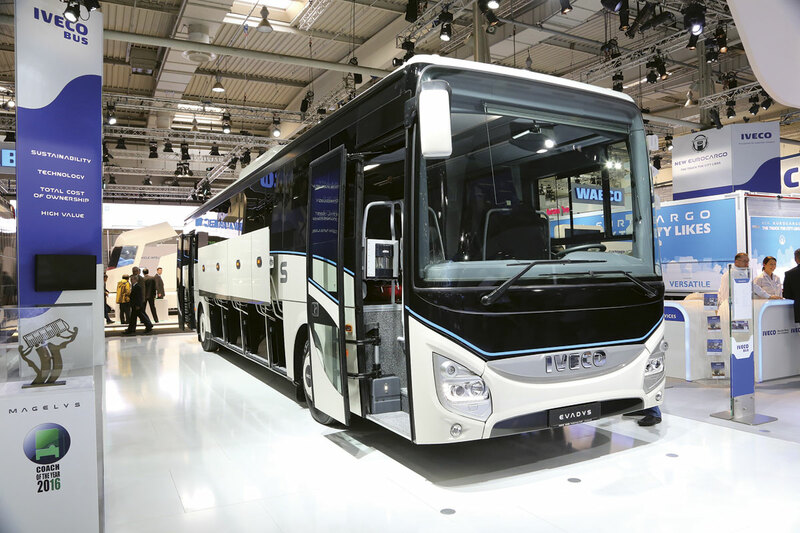 Ayats are planning to be at Euro Bus Expo, the company also advised that an electric version of its open top sightseeing double decker is under development. I didn’t speak to anyone on the Auto-Cuby stand but did notice their 31 seat plus courier and driver coachbuilt offering on the Iveco Daily 70C 7.2-tonne chassis, which looked useful and attractive. They also showed a 19+1+1 conversion of the Mercedes-Benz Sprinter 519 with a large and accessible luggage hold that extended beneath the seating area. On the same Sprinter base was a City Line single side door bus conversion for 14 standees with 12 seats and two tip-ups. The innovative Austrian producer showed its new full low floor Burgerbus City 1 based on a VW T6 front end. All eight seats are floor mounted and the vehicle is intended for communal use rather than as a PCV. Kutsenits also showed a Mercedes-Benz Sprinter, one of a number of exhibitors to use this as a basis for much of their production. 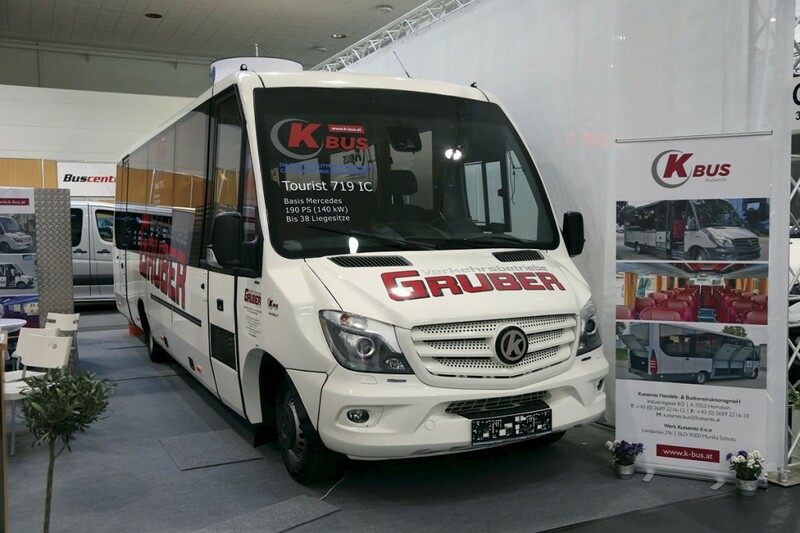 Other minibus exhibitors included Integralia, Rosero, Altas, OV Steinborn, FT Busvertrieb and TS Fahrzeugtechnik. 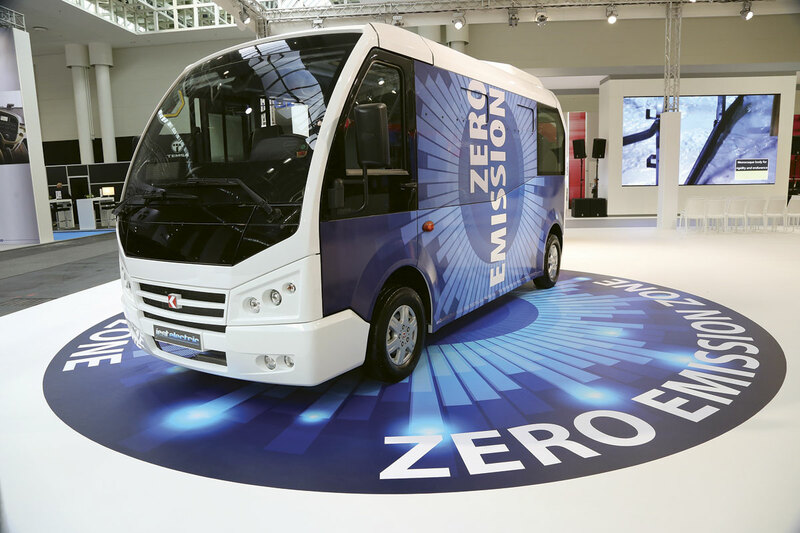 In addition to the manufacturers mentioned in this IAA report, Ebusco, CRRC and Ziehl Abegg showed exclusively electric powered vehicles, the latter promoting an external display featuring vehicles from Hybus (on a Solbus basis), Ursus Bus and Ekova. 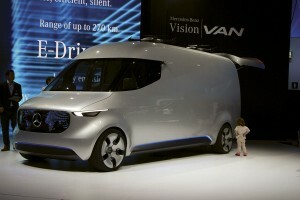 In another approach to electrification, on the Hyundai stand was a concept fuel-cell powered minibus. 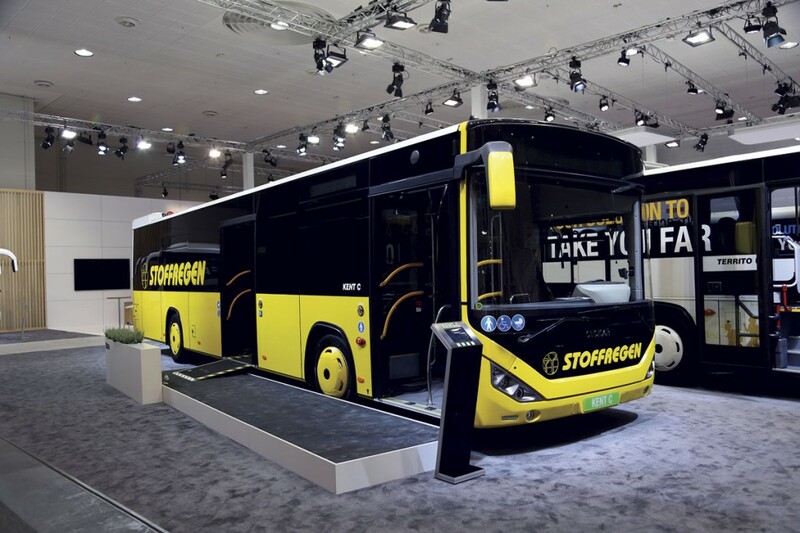 Reports on all these vehicles, many of which were available for test drives, will feature in next week’s report on electrification of the European bus industry based on the displays at IAA and the parallel Innotrans in Berlin. The latter featured Solaris, Belkommunmash, Bozankaya, VDL and Lohr alongside a number of charging infrastructure suppliers. There was an immense amount of new technology there, and the development work we were told is being undertaken is immense, especially with regard to electromobility and connectivity, but with so much new brought in two years ago to satisfy Euro6 and many of the major manufacturer’s electrical options yet to be fully developed and productionised, there was also a sense in which this show felt like there wasn’t that much new to actually see. Just as in the battle to make vehicles more efficient ever greater work is now required to make even very small overall fuel savings, so it is that with tight margins, massively increased legislation and the need to homologate every minor change, introducing new models is something that you don’t do simply for the sake of fashion.